No matter what’s on the menu this holiday season, your tablescape deserves a special touch. Today I created a free napkin holder printable to help add a little sparkle to your place settings. All you need is a couple of supplies and a printer! 1. These napkin holders are super simple to make. 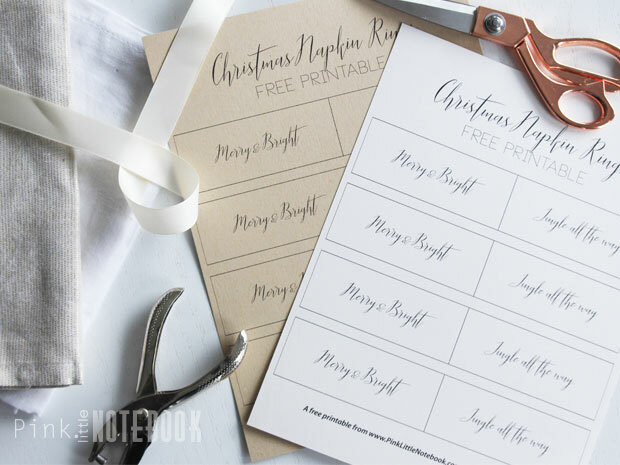 The first thing you will want to do is download the free printable using the link below. 2. Be sure to print on heavy text paper or card stock. You can get creative and use fun colours to match your holiday decor. 3. Cut each rectangle out just inside the black line. Carefully punch holes on either sides of the rectangle. 4. Depending on how big your napkins are, cut as many lengths of ribbon as you need. About 10 inches should be a good length. That will give you plenty of room to snip the ends neatly. 5. 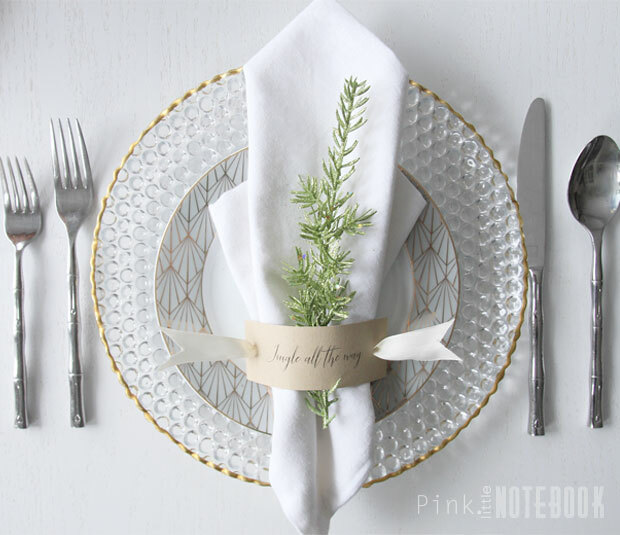 Lay a piece of ribbon on a flat surface lengthwise and place your folded or rolled napkin on top of the ribbon. If you want to get fancy with your napkins, just YouTube some napkin folding techniques. There’s a ton of great ideas. 6. 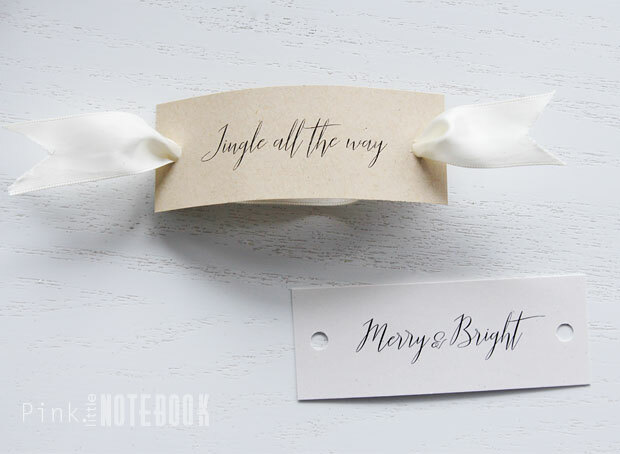 Take your rectangular shaped printable and carefully poke the ends of the ribbon up through the holes on each side. 7. Pull the ribbon tight but do it very gently so you don’t tear through the hole. Snip the ends of the ribbon so they are equal length. 8. 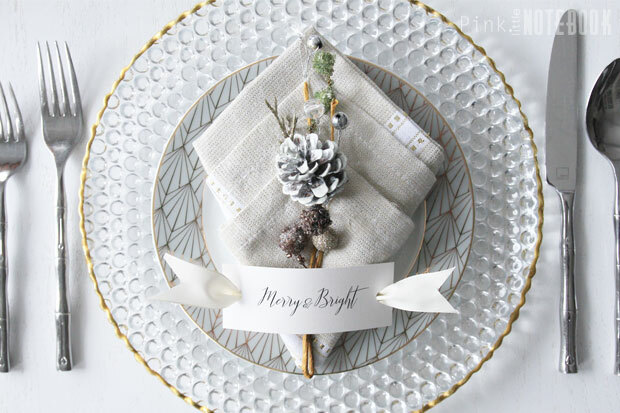 To add a little pizzazz tuck a piece of fresh greenery, a candy cane or embellishment behind the napkin ring. The sky’s the limit. You can definitely make these a few days in advance to your event. Would you please sign me up for the newsletter? I just found your account and love everything so far. Can you tell me where the plate and charger are from in this post? Such a beautiful place setting! Thanks! Hi Steph, they are from Homesense.